Okay, I’ve spent basically all of the last month talking all about how I went from a regular Hawk fan to the author of two Hawkeye books. This is my final post on that journey…I hope you enjoyed reading about how it all came together for me. But I have one last story for you about my first ever radio appearance with Pat Williams, so here goes! I had done a few interviews for newspapers and the like, but I had never conducted a radio interview in my life. In August 2011, Natalie, our Publicity Manager at Triumph Books, contacted me and asked if I’d be willing to do a live interview for What It Means to Be a Hawkeye on Pat Williams’ radio show. I jumped at the chance, of course, but I must admit, I was also very intimidated at the thought of being on the radio with Williams. For those who may not know, Pat Williams is an absolutely incredible guy. At the young age of 29, he became the general manager of the Chicago Bulls in 1969. He spent four years as the Bulls’ GM and one year as the GM of the Atlanta Hawks before leaving for Philly in 1974. Williams served as the general manager of the Philadelphia 76ers for 12 seasons, assembling a roster that won the NBA championship in 1983. 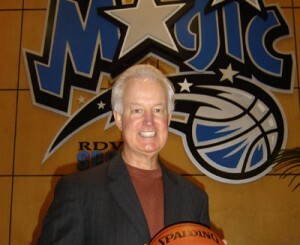 In 1986, Pat Williams resigned as the Sixers GM to become the co-founder of an NBA expansion team, the Orlando Magic. He was the Magic’s first general manager and was responsible for putting together an Orlando roster that made the NBA Finals in 1995. Following that season, Williams was promoted, leaving the general manager’s office to become the team’s senior vice president, where he still serves today. He has had a spectacular career as an executive in professional basketball, drafting such players as Charles Barkley and Shaquille O’Neal. On top of all that, Pat and his wife are the parents of an astonishing 19 children, 14 of which they have adopted from foreign countries. He has run the Boston Marathon 13 times and completed 55 marathons the past 15 years. Williams is one of the nation’s top motivational speakers, and he has written 65 books! Needless to say, Pat Williams is an amazing guy. Being on the radio is actually pretty nerve-wracking. Everything is live, so if you stammer, mumble, and otherwise freeze on air, you don’t get a do-over. As a writer, I’m quite comfortable writing, rewriting, and re-rewriting until my words are exactly as I want them to be. On the radio, well, you get one shot. Don’t screw it up. On top of that, I’m going to be doing an interview with a guy I really admire. I actually owned one of Williams’ many books, a book called Secrets to a Lifetime of Success. And it’s not like I found out I was going to be talking to him and bought one of his books…no, I already had one of his books sitting on my bookshelf when Natalie told me that this was the guy who was going to be interviewing me live. Anyway, I was so nervous, I’m sure I gave a less than stellar interview. But you know what? It was one of the most surreal moments I’ve had writing these books on sports, and that’s saying something! Well, I’m finally done gratuitously name-dropping, so that’s it! That’s been my journey over the last two years, and it’s been a whirlwind ride. But there’s even more to come, folks! In the meantime, thanks for reading, and have a great day.